Cordyne offers the full line of Eaton Cutler-Hammer electric motor starters and starter packages. These high quality starters can be purchased as stand-alone units for your application or can be integrated as part of a full industrial power control system. Heavy duty enclosure which is painted steel with ANSI61 gray powder coating. All components are mounted to enclosure’s back-pan. Enclosure is rated for NEMA 4, 3R, 13, 12, 1 applications. IEC Contactor with adjustable thermal overload (Class 10). NEMA, UL, CSA & IEC rated components only. A wide range of standard options make it possible to adapt a “standard” control to your particular needs. Oversized Control Power Transformer is optional. Units are assembled, pre-wired, and ready to go straight out of the box. Heavy duty enclosure which is painted steel with ANSI61 gray powder coating. All components are mounted to enclosure’s back-pan. Enclosure is rated for NEMA 4, 3R, 13, 12, 1 applications. IEC Contactor with adjustable thermal overload (Class 10). 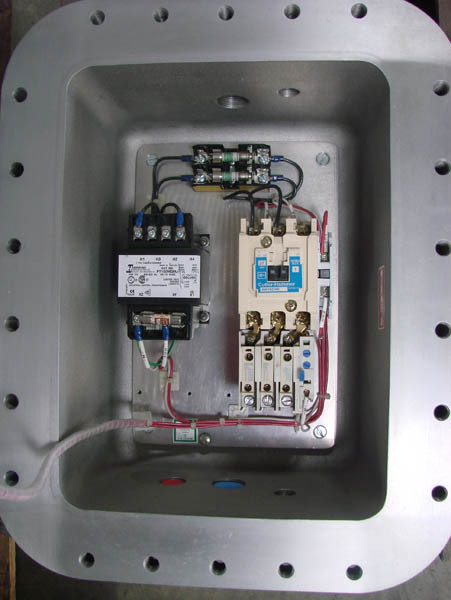 NEMA, UL, CSA & IEC rated components only. A wide range of standard options make it possible to adapt a “standard” control to your particular needs. Oversized Control Power Transformer is optional. Units are assembled, pre-wired, and ready to go straight out of the box. Molded Case Circuit Breaker with through-the-door handle. Heavy duty enclosure which is painted steel with ANSI61 gray powder coating. All components are mounted to enclosure’s back-pan. Enclosure is rated for NEMA 4, 3R, 13, 12, 1 applications. NEMA Rated Non-Reversing motor starter with three leg protection overload heaters (included standard-sized to rated chart amps). Reset pushbutton is standard on all units. 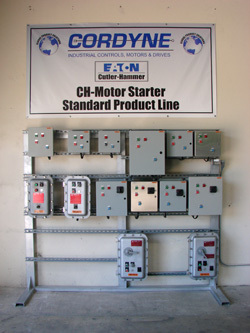 NEMA, UL, CSA & IEC rated components only. A wide range of standard options make it possible to adapt a “standard” control to your particular needs. Oversized Control Power Transformer is optional. Units are assembled, pre-wired, and ready to go straight out of the box. Heavy duty enclosure which is painted steel with ANSI61 gray powder coating. All components are mounted to enclosure’s back-pan. Enclosure is rated for NEMA 4, 3R, 13, 12, 1 applications. NEMA Rated Non-Reversing motor starter with three leg protection overload heaters (included standard-sized to rated chart amps). Reset pushbutton is standard on all units. NEMA, UL, CSA & IEC rated components only. A wide range of standard options make it possible to adapt a “standard” control to your particular needs. Oversized Control Power Transformer is optional. Units are assembled, pre-wired, and ready to go straight out of the box. Includes a Molded Case Circuit Breaker with through-the-door handle.